We’ve enjoyed a pretty good spring of light-tackle fishing on the Chesapeake Bay. Water temperatures warmed early, then leveled off through the end of April into May. Top-water casting is good right now at some places. Some anglers are even sight-casting surface lures and flies to cruising fish on shallow oyster bars near the mouths of the rivers. The water in some parts of the Upper Bay is clearer than I’ve ever seen it. While that makes surface fishing enjoyable, it also makes jigging tough since it’s easier for stripers to distinguish the difference between our lures and baitfish. The clear water looks nice, but there’s a big problem lurking below the surface: Low dissolved oxygen (DO). 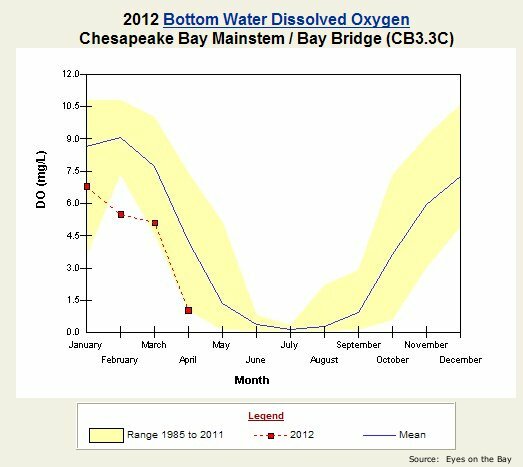 Measured in milligrams per litre, dissolved oxygen levels were recorded at 1.04 on the bottom beneath the Bay Bridge in April. That’s lower than they’ve been in twenty-five years. Look out for big algae blooms coming soon. Salinity also peaked to record levels in April. Last spring, Bay Bridge salinity was 4.20 ppt. This year, it’s more than twice that at 10.50 ppt. 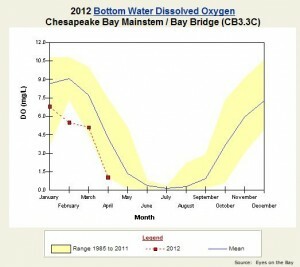 DO levels are also low in Eastern Bay, although salinity there is closer to normal. What does this mean for the fishing? 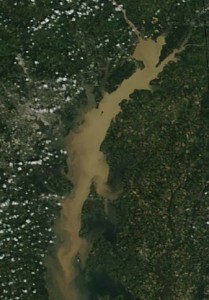 Low dissolved oxygen levels have historically been related to the amount of fresh water coming down from the Susquehanna and other upper Bay rivers. Usually, more fresh water entering the Bay in the spring means higher DO. For example, spring runnoff was very high back in 1993, and that was a year when DO levels were also very high. But wait a minute, this year we had a mild winter with very little snow in the Susquehanna basin, so there hasn’t been as much freshwater flow. Also, the water is clear indicating there aren’t as many nutrients as in years past and fewer algae blooms. Why is the oxygen so low? Ed Liccione, president of CCA Maryland, recently asked Maryland DNR scientists this question. Apparently, it’s somewhat unclear, but according to the experts, warmer water is partially responsible. We may also still be seeing the results from last year’s Hurricane Irene and Tropical Storm Lee. Even though these storms temporarily flushed the dead zones out of the Bay, they also brought down thousands of tons of nutrients and bay-grass-killing sediment from the northern rivers. Just after the storms hit, scientists told us we’d have to wait and see what the negative effects might be (see link). It’s been eight months, are we seeing them now? The unfortunate effect of low DO on fish is that it reduces their habitat. That means places that were once prime fishing spots may no longer be. A good example is the deeper pilings around the Bay Bridge. According to some of the old-timers I’ve talked to, there was a time when you could easily catch rockfish and trout in depths of forty feet or more on the bottom around the pilings. That doesn’t happen anymore. Now if fish hold around the deep pilings, they’re always suspended because they can’t survive down deep anymore. Fishermen have to look in shallower water for a more consistent bite. 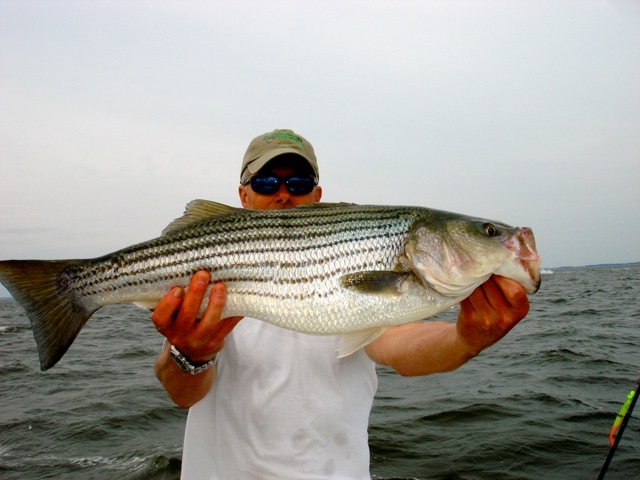 If you’ve read my book Chesapeake Light Tackle, An Introduction to Light Tackle Fishing on the Chesapeake Bay, you know that fish would rather eat a little in water they find comfortable, than a lot in conditions they don’t like. I fished the past couple of evenings and found that striped bass in the main stem of the mid and upper Bay are tightly squeezed into a feeding zone between eighteen and twenty-four feet deep. 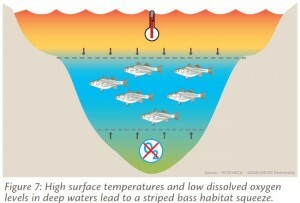 Due to an early hatch of May worms, the fish are feeding on or near the bottom. That means we have to look for productive ledges at that very specific depth, and we have only a six foot strike zone in which to jig. Tough! Fortunately, the water gets better once you get away from the main stem and there are some fish feeding on top now along the shore near the mouths of the rivers. The necessary ingredients are clean water, moving current, baitfish, and deeper water close by. Just like with jigging conditions, that can be a difficult combination to find, but there are enough places like that around to make looking for them worthwhile. Spooks are producing better than chuggers for me right now. The most productive topwater lure I’ve seen this spring has been a white Lonely Angler Zipster Spook. My buddy Jamie Clough fished circles around me a couple of times with this lure before I finally had the good sense to look into my tackle box and pull out one of my own. Things are getting better at the Bay Bridge but the bite is still somewhat inconsistent. My friend Kevin Keno from Rockville, Maryland has pulled out some nice piling fish recently using his old-school bucktail and pork rind technique. Sometimes the tried and proven methods are the best. Expect fishing at the bridge to pick up over the next couple of weeks. I hope to get out some this coming weekend and I’m also planning a speckled trout trip soon down around the islands of the Tangier Sound. I’m collecting more information about those low DO levels and I’ll keep you posted. If you’d like more infomation, check out Maryland DNR’s comprehensive Eyes On The Bay website or sign up for their Facebook or Twitter feeds. In the mean time, let’s hope DO levels start heading back in the right direction and that the fish get a little easier to catch! Wikipedia has a good entry on eutrophication. Only part of the problem, but we’ve got to reduce runoff. Just another challenge to figuring out how to consistantly catch these fish… Thanks for the report. Do you think a good “freshet” will help with the low DO? Yes, I think it would help, Joe. And this rain we’re getting now could go a long ways. We could also use a few strong thunder storms. My buddy J.P. tells me storms with strong winds can make more of a difference in O2 levels than anything. I forgot to mention in my post that stripers prefer DO at 5 or 6 mg/l. The 1.04 on the bottom at the bridge is not survivable for them right now. Baitfish on the other hand, especially menhaden, silversides, and spot, can go right on at 2 or 3. So, it’s not enough just to find the bait right now. 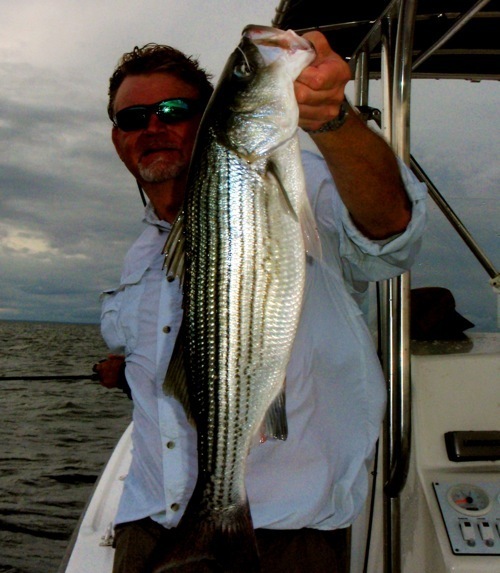 You gotta find the bait in a zone that the stripers like, then when you get there, hope they aren’t eating May worms. Whew! Nice write-up ol’ buddy…suspended fish!!!!Yes! Oh, you saw that…. I need a better editor! Nice write-up. It will be interesting to see if we get similar patterns as last year, this summer. Great information Shawn. Thanks for sharing. Guess I’m praying for some storms with big blow. (During the weekdays only) I want to hear more about that speck trip. THE ZIPSTER SPOOK LOOKS A LOT LIKE A SKITTER WALKER WHICH HAS BEEN A GOOD PRODUCER OVER THE YEARS.IT HAS A REAL GOOD DOG WALK AND VERY UNIQUE RATTLE SOUND TO IT. Thanks for mentioning our MD DNR Eyes on the Bay website. I manage this program and am glad people are finding it useful outside of our main mission of tracking, analyzing and reporting results of water quality for regulatory purposes. And a new feature where we’re providing alerts for real-time water quality stations via Twitter. Can’t believe Jamie went to all that trouble to change to 02 levels just so he could fish for more suspended fish. We’ll be up around the 4th of July. Not sure if any big’uns’ll be hanging around, but we’ll put the kids on some fish and have a blast. .02 Level? I got up to that level just driving from the ramp back to the farm. But I never drink when fishing under competitive circumstances. When the tail-gate drops: the bullshits stops! From the Law Offices of Jimmy Tilghman. Capt…you live on a farm…have a pickup..and your a lawyer?..I bet were cousins..man we need to fish together some time..any chance you troll?…wait..I don’t troll so that won’t work..
Nice article Shaun. What salinity levels do Rockfish prefer? I just checked a few stations (BB, EBay, Chester) and it looks like conditions are getter better. DO is increasing and salintiy decreasing. Guess we had a decent amount of rain,out deeper I could see on the sonar where the fresh water was laying on top of the saltier stuff. A few fish around today, above the bridge.Most in 20′ to 25′ Main stem . Pretty dang frustrating when they wont hardly bite.